The first chartered flight from Almaty, Kazakhstan, carrying more than 200 passengers, landed at the Sanya Phoenix International Airport on Oct. 22, unveiling the start of the tourist season. The 200 passengers, arranged to stay in star-related hotels at Sanya Bay and Yalong Bay, will have a week-long holiday in Sanya. 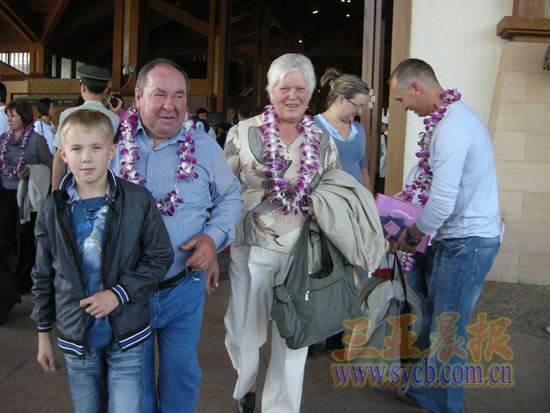 The route between Almaty and Sanya is extremely popular. Tickets for the first charter flight have been booked up since the end of September, said the travel agent responsible for this flight’s business. The flights will be operated one pair a week for 6 months during the high season. With the rising international reputation of Sanya as a tourist city, flight tickets from now on till the beginning of next year have been almost sold out. Last August, Hainan extended its visa-free policy to other five countries, namely, Finland, Denmark, Norway, Ukraine and Kazakhstan, following 21 countries granted the visa-free status. To meet increasing passengers’ demands, airlines company decided to launch another charter flight from its capital Astana to Sanya and also intensify the Almaty-Sanya flights to make sure the total flights to Sanya reach seven monthly.